Synopsis: Thus far we have exposed the two sides of the betrayal of liberal economics. On the one hand (the first four chapters), we discussed the betrayal in the sense of the false promise generated by the pretence of a universal and ethically neutral system of competitive decentralised decision-making. On the other hand (Chaps. 5 , 6 and 7 ), we explored the betrayal in the sense of the misconception of the idea of liberal economics given the inability of economics to capture the sociality which is embedded in human nature. In this chapter, we ask what could be the possible meaning of liberal economics had we integrated human sociality into the foundation of our economic analysis. 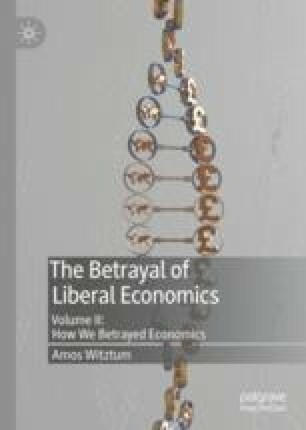 In so doing, we explore a third aspect of the betrayal: the misinterpretation of liberal classical economics. We argue that what is known as liberal classical economics is indeed a form of liberal economics where the sociality of agents plays a significant role. Therefore, while the modern belief that classical economics is merely a primitive form of modern economics suggests an intellectual betrayal, it also offers an opportunity to examine what liberal economics could look like. By examining some aspects of classical economics, we uncover the difference between a conceptual framework of liberal economics which is organically social and the one which is entirely functional. In the former framework, economic analysis is a consequence of social interaction, while in the latter society is the consequence of economic interactions. At the same time, the analysis of natural liberty—the system of competitive decentralised decision-making—is, in the one case, measured against its purely economic success in producing plenty, while in the other case it will be measured against the ability of the system to service the social drive behind it.